EWG scientists reviewed Arganat GLAMOUR MASK Instant Glow (old formulation) for safety according to the methodology outlined in our Skin Deep Cosmetics Database. We assess the ingredients listed on the labels of personal care products based on data in toxicity and regulatory databases, government and health agency assessments and the open scientific literature. 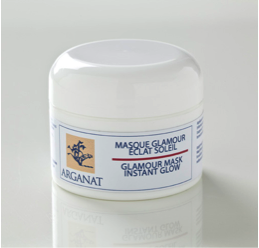 EWG's rating for Arganat GLAMOUR MASK Instant Glow (old formulation) is 1. Kaolinite (French White Clay), Aqua, Kaolinite (Moroccan Red Clay), Rosa Damascena Flower Water, Argania Spinosa oil, Maris Sal, Chamomilla Recutita Flower Water, Calendula Officinalis Flower Water, Origanum Vulgare Leaf Extract, Rosa Damascena Flower Oil, Citrus Aurantium Amara (Bitter Orange) Flower Oil, Citrus Medica Limonum (Lemon) Oil, Citrus Aurantum Bergamia (Bergamot) Oil, Lavandula Angustifolia (Lavender) Oil, Rosmarinus Officinalis (Rosemery) Leaf Oil. Apply mask on face and neck and rest for a few minutes. Avoid eyelids. Wash thoroughly and gently to remove the mask with cold or warm water. For all skins. Test in a smaller zone before use.